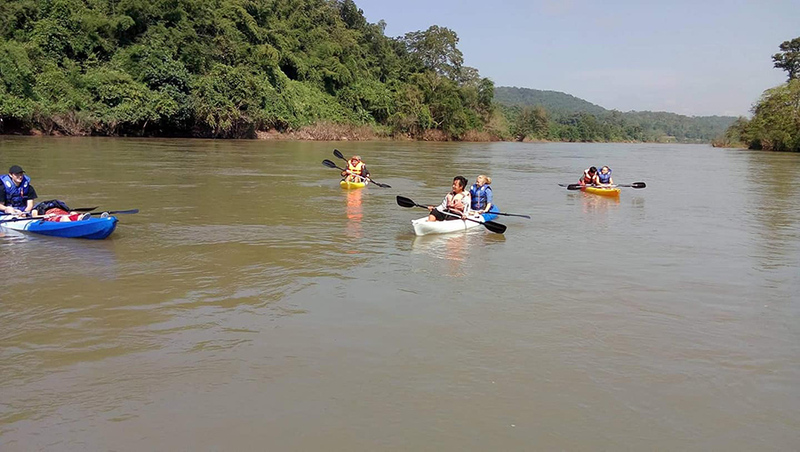 YANGON—Hsipaw Police Station has confirmed to The Irrawaddy that a female South Korean tourist has been missing for a week and is feared dead after last being seen floating on an inner tube in the Namtu River, a popular tourist destination in northern Shan State’s Hsipaw Township. Speaking to The Irrawaddy on condition of anonymity as he is not authorized to speak to the media, a police sergeant said Korean tourist Younghee Heo, 45, and four other holidaymakers from Belgium, France, and Italy went trekking together to Moe Te village in Hsipaw Township with a local tour guide on Nov. 21. Citing witnesses, the sergeant explained the woman and her friends were floating on inner tubes in the Namtu River on Nov. 23 when Heo disappeared beneath the water. According to the sergeant, an Italian man believed to be Heo’s partner tried to rescue her multiple times. A local tour guide told police he suggested several times that Heo and the other four tourists wear lifejackets but the woman declined, saying she was a good swimmer. Hsipaw-based tour agency Ko Pee Travel confirmed that local authorities and tour agency employees had been conducting daily searches for Heo. The police sergeant said a consul from the Korean Embassy in Yangon and the victim’s brother had arrived to join the search. He said the main reason tourists traveled to Moe Te was to see the Nam Hu Nwe waterfall. The Ministry of Hotels and Tourism had not released any information on the incident as of Friday. According to the Tourism Ministry’s website, foreigners are not legally allowed to visit the areas outside downtown Hsipaw. In reality, however, local agents will drive tourists to the Namtu River and the Nam Hu Nwe waterfall upon request. Though not far from Hsipaw, the waterfall is located in Kyaukme Township, in territory that is claimed by ethnic armed groups. Although police do not issue travel permits to tourists, many local agents and tourists travel to the restricted areas and sometimes even spend the night in tree houses in densely forested areas, and visit natural caves. Ko Pee said many locals are poorly educated about the laws, and most have no idea whether taking tourists to restricted areas is legal or not. He said that almost 100 tourists had come to see the waterfall and go trekking and kayaking in the Namtu River this month. However, he said tourist arrivals to his town had declined compared to previous years because international tour agencies discouraged travelers from visiting Myanmar following a finding by the UN accusing the Myanmar military of acting with “genocidal intent” toward the Rohingya community in northern Rakhine last year, and calls by the UN Fact-Finding Mission that the Army chief be prosecuted at the International Criminal Court for his role in the crisis. In an attempt to draw more tourists from Asia to make up for the drop in Western visitors, the Tourism Ministry launched a visa-free system for tourists from South Korean, Japan, Hong Kong and Macau last month. The following week, the very first batch of over 400 tourists arrived, mostly from Korea and Japan. According to the Tourism Ministry’s latest information published in October, tourist arrivals from China had increased by 35 percent from last year. Those from Thailand, India and Malaysia accounted for 6-9 percent of total tourists and the number of Korean visitors was up by 1 percent.